I haven’t written about climate controversies in quite a while. Between Climategate, which discredited many prominent climate scientists, and impending economic catastrophe, which has made speculations about potential future catastrophes seem indulgent, concerns about global warming have been relegated to the back burner (no pun intended). But the recent news about the CERN experiment testing the Svensmark hypothesis is worth comment. Svensmark’s work is an attempt to explain the most inconvenient truth for AGM advocates: the strong correlation at all time scales between measures of solar activity and temperature. Of course, correlation does not imply causation, but it is implausible that terrestrial conditions–including CO2–affect the sun. It may be the case (though highly unlikely) that some other factor affects both the sun and our climate, but this undermines the importance of CO2 as a major climate driver. The correlation is well known. The mechanism is not. AGM advocates have demonstrated that variations in the amount of energy reaching the earth from the sun are not sufficiently large to explain variations in earth temperature. Fine. That rules out one explanation of the correlation. But it does not make the correlation disappear. It is a fact that hangs there. Years ago Svensmark hypothesized that variations in solar activity affected the amount of cosmic rays reaching the earth, and that cosmic rays affected cloud formation. Variations in cloud cover driven by variations in cosmic radiation driven by variations in the sun, according to Svensmark, cause variations in temperatures and other climate variables on earth. Svensmark has been dismissed by the climate science establishment. This establishment has gone to great lengths to prevent testing of his hypothesis. The multi-government funded, and very politically sensitive, CERN dragged its feet for years before grudgingly making resources available to test it. The initial results, announced in late-August, do not reject the hypothesis, and are generally supportive of it. If the establishment scientists were acting more like scientists than an establishment, they would have welcomed speedy and thorough testing of Svensmark’s conjecture. If they were truly confident in the AGW explanation for climate change, they would have had nothing to fear from testing of an alternative explanation, and should have indeed wanted empirical evidence that would have allowed them to reject it. This would have discredited “skeptics” and bolstered confidence in their preferred explanation. But in acting like the Inquisition to Svensmark’s Gallileo, the establishment scientists betray deep insecurity about their explanation for climate variations–and no doubt their funding, which hinges crucially on the acceptance (not the correctness) of that explanation. If the AGM hypothesis is indeed as strong as they insist, they would have nothing to fear from a rigorous test: yet fear is clearly evident in their continued efforts to squelch not just this research, but exploration of alternative hypotheses more generally. This whole sordid tale reveals just how corrupting Official Science can be. Big science funded by government becomes less like science and more like government: politicized, bureaucratic, and driven by vested interest and money rather than a strong desire to find the truth, the chips fall where they may. The mechanism that Svensmark posited decades ago may be wrong. Future tests may reject his hypothesis. But absent surprising new empirical evidence, the Big Fact hangs there: there is a strong association between what happens on the surface of the sun and what happens on the surface of the earth. That fact neither rises nor falls on Svensmark’s hypothesis to explain it. The fact is antecedent to the explanation. As long as that fact remains a fact, CO2-based explanations are tenuous, at best. No existing climate model explains this correlation. In real science, this should stand as a decisive rejection of those models, and the theoretical foundation on which they rest. Until such models can explain this salient fact, little–if any–weight should be placed on the reliability of their predictions about relations between CO2 and climate variables. The CERN CLOUD experiment has let some sun shine on the dark corners of climate science, and the view revealed is not a pretty one. Much more sunshine is needed to purify the smelly orthodoxy that is establishment climate science. 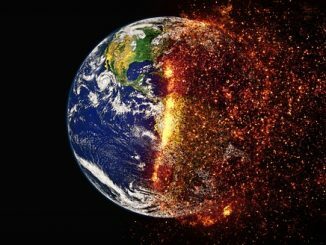 Until that establishment can demonstrate a serious willingness to tackle a major empirical and theoretical challenge, it will have fully earned the oblivion to which it is currently headed, to the accompaniment of Al Gore’s lunatic ravings. Are We In for An Unbreakable Cycle of Global Warming?